The presentation that accompanied this short paper is here. The goal of this project is to identify a handful of sites within Seaside, CA on which it would be feasible to place weather stations for public weather data reporting. These locations will be subject to several constraints, such as following best practices for station placement. The rationale behind weather station placement is twofold: one is for weather data to facilitate better planning within the city of Seaside (for automated solar panel candidate evaluation, for example), and also for the publicly reported weather data which will support accurate forecasting both for public agencies but also for smart phones of citizens and tourists nearby. ArcMap will be utilized to select these potential sites, because it would be infeasible to do this without GIS software (except to pick sites entirely at random). Research question: What are good sites in the city of Seaside to install weather stations which do not overlap with current weather observatories, and which avoid common pitfalls of weather station site selection? 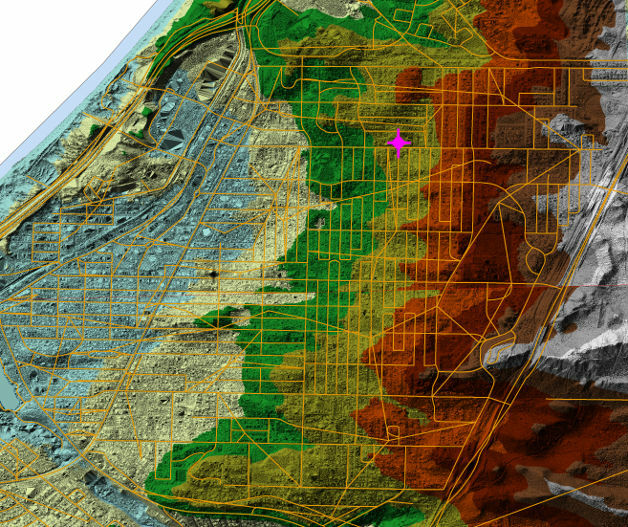 Dr. Patel provided Lidar data for the city of Seaside, as well as the highway network and Traffic Analysis Zone data which is essential to site selection. All analysis was manual. First the base data was loaded, specifically the 2010 base Traffic Analysis Zone data for Monterey County. Following that, the Lidar data graciously provided by Dr. Patel was added. Lastly, the 2010 highway network layer was added to the map. There are 6 sections of LiDaR data, and that data is in TIN collections. Those sections are 3av_14 and 15, 3aw_14 and 15, and 3ax_14 and 15. I grouped them within Arcmap to ease turning all Lidar data on/off at once. Lidar data grants the ability to denote where the hills and valleys are, and avoid the wind-tunnel effect which plagues portions of Seaside (such as the East end of Broadway). The data also grants (with more advanced analysis) the capacity to classify objects like trees (which must be avoided during station placement), and possibly even parking lots (which also must be avoided by a 600 foot radius, due to the heat). Suggested sitings are: The Seaside USPS office, Highland Elementary, Seaside High School, and St Francis Xavier Church. These sites are suggested not just for their diverse placement (both on an elevation and microclimate level), but also for their potential institutional support. Each is a bedrock of the city of Seaside. If only one location agreed to host a weather station, the data would be improved immensely. With the support of two or more of these sites, great weather accuracy will be had. The strengths of the project include clear recommendations, and a clear public interest of completing the installation. Weaknesses may include the justification for particular potential sites over others. The sites, without additional time and research, are "decent" but not "perfect". Thanks are due to Dr. Patel for the LiDaR, and other data, without which this project would not be possible.